The former junior health minister says she is “semi-detached” from the party. 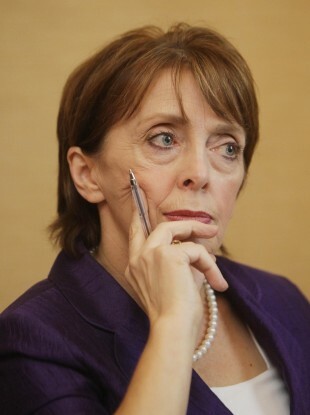 FORMER JUNIOR HEALTH Minister Róisín Shortall is considering quitting the Labour Party altogether. The Dublin North-West TD has been outside of the Labour parliamentary party since she quit as the Minister of State for Primary Care at the end of September last year over a number of disputes with Health Minister James Reilly. She has been a consistent critic of a number of government policies since then and has said she is now “semi-detached” from the Labour Party but declined to confirm whether she will now resign her membership. “I’m semi-detached. I am considering the situation, but I am not making a statement at this point,” Shortall told TheJournal.ie this evening following the resignation of Nessa Childers from the party earlier today. Childers is the latest member to quit the party over policies it has pursued in government. Meath councillor Jenny McHugh also resigned from Labour today, becoming the latest of over a dozen councillors who have quit the junior coalition partner. Among its TDs, former chairman Colm Keaveney and Dublin West deputy Patrick Nulty resigned their memberships last month. Meanwhile, Shortall denied a report in the Irish Times at the weekend that she has been making moves to establish a new political party having spoken to Donegal South-West TD Thomas Pringle. “I was amazed when I saw the story, there are no talks on the way and I have never said more than ‘hello’ to Thomas Pringle,” she said today. Shortall said there has been “a lot of talk” about the possibility of forming a technical group to obtain speaking rights but Dáil standing orders prevent there being more than one technical group. She said that a legal challenge to this situation has been suggested but no more than that at this point. TDs outside of the parliamentary whip are in a position where they do not have automatic speaking rights during debates on legislation and cannot get on Oireachtas committees. Shortall added that now a busy Dáil session is over she will have time to consider what options are open to her and other ostracised TDs before deputies return in September. Email “Another one bites the dust? Róisín Shortall considers quitting Labour ”. Feedback on “Another one bites the dust? Róisín Shortall considers quitting Labour ”.